Fee: $15/$10 members. Bring along your lawn mower blade for a free sharpening by Lynden staff following the workshop. Those attending the pruning workshop in the morning are welcome to pack a lunch to eat at Lynden. Registration Registration is closed. For information on upcoming sessions, sign up for our email newsletter. 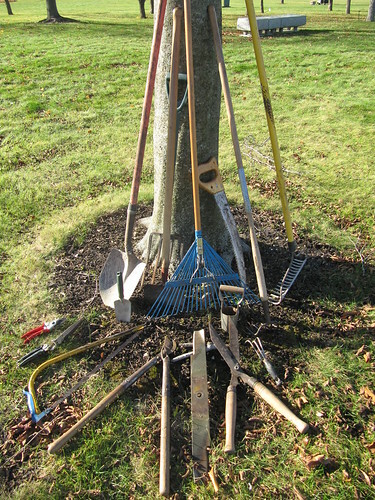 Join Andy Yencha and Weston Wagner, Lynden’s land managers, for a hands-on workshop designed to get your lawn and garden tools in tip-top shape for the upcoming growing season. Garden tools are no strangers to abuse and generally do their jobs with minimal care, but top-performing tools are both easier and safer to use and sharp tools cut plants cleanly which promotes better plant health. Andy and Weston will discuss the many benefits of sharp tools and then demonstrate how they keep Lynden’s shovels, hoes, rakes, pruning tools, and lawn mower blades maintained, sharing tips on removing rust and on environmentally friendly lubricants and rust inhibitors They will discuss various sharpening methods and show you how to use a sharpening file, water stone, and electric grinding wheel on both digging and pruning tools. Following these demonstrations, participants will get a chance to practice on the personal tools they bring to the workshop or tools provided by Lynden.